Mr. van Dongen had a distinguished career serving as a first violinist with the world famous Royal Concertgebouw Orchestra in Amsterdam from 1989 to 2004 and worked closely with Leonard Bernstein, Antal Dorati, Carlo Maria Giulini, Nikolaus Harnoncourt, Bernard Haitink, Pierre Boulez, Ricardo Chailly and Mariss Jansons. Between 1988-1989 Antoine van Dongen was first violinist of the Rotterdam Philharmonic Orchestra. He has been a member of the Chamber Orchestra “Per Musica” and the Dutch Bach Soloists. Mr. van Dongen played regularly with the Orchestra of the Eighteenth Century and worked with Frans Bruggen. 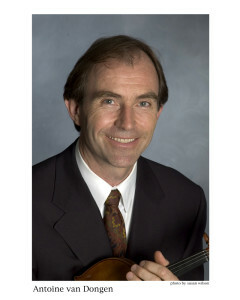 He has served as Concertmaster of the Dutch Baroque Ensemble. As a founding member of the Feininger Piano Trio and the European Boccherini String Trio, van Dongen participated frequently in Master classes with the Beaux Arts Trio and the Guarneri Trio. Antoine van Dongen was a Silver Medalist at the National Violin Competition Oskar Back in 1983 and won the “the prize of the City Amsterdam” for the best interpretation of contemporary music. The prize scholarship enabled him to study at the Mozarteum in Salzburg with Sandor Vegh. The same year Antoine van Dongen made his debut in the Concertgebouw in Amsterdam. Concertmaster of The Royal Concertgebouw Orchestra). Antoine van Dongen moved to the Bay Area in 2012 and became a member of the San Francisco Chamber Orchestra. He gave masterclasses at the University of the Pacific and teaches students from Stanford University and the Ruth Asawa San Francisco School of Arts. He plays regularly with the Empyrean Ensemble at UC Davis, the ECO ensemble at UC Berkeley, and is on the faculty of the Finn centre of Music and Arts in Mountain View.